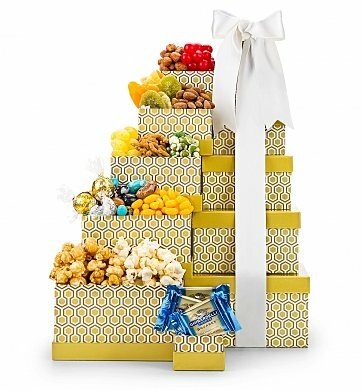 Everyone will enjoy this sophisticated take on snacking, with six exclusively-designed gift boxes filled with snacks and sweets, old-fashioned candies, confections and much more. Ghirardelli Chocolates, Lindor Truffles, White Cheddar Popcorn. Lemon Drops, Cherry Sours and more Old Fashioned Candies. Each item is carefully assembled by hand and the gift is accentuated with a hand-tied satin ribbon. Complimentary scissors are included so your recipient can easily open their gift, as well as a free card with your personal message or greeting. Your gift will leave a lasting impression as they continue to use and enjoy these six exclusive keepsake boxes, stacked together to make a tower. First Choice Gourmet Gift Tower is a hand delivered gift. These gifts are delivered by one of our local design centers located throughout the United States and Canada. Same day delivery is available for most gifts when ordered before the cutoff time. The cutoff time for First Choice Gourmet Gift Tower is 2 PM in the recipient's time zone. Ghirardelli chocolate squares, Lindt truffles and more. Six exclusively-designed gift boxes with hand-tied satin ribbon. I ordered this item as a thank you to friends. They were extremely appreciative as they told me how beautiful the gift was. But better yet, they said the items in the boxes were wonderful. I will order from this company in the future! I got this for My Fianc? on Valentines day and he loved it! It was also delivered on time. So thankful for GiftTree because I live on the other side of the world, and through this, I was able to surprise the love of my life with their help. Will surely order again nextime! Kodus! My purchase arrived on time and looked exactly like it did on line! My daughter loved her gift!!!! I purchased this gift for my sister's birthday from two separate states. The gift arrived on schedule, was in the cute little boxes, and my sister enjoyed the different treats within each of them. She also said the gift came with scissors to assist in opening the treats. I am very pleased with my purchase, and price, and the delivery. I will shop with GiftTree again, and also recommend them to others. Thanks.. I'm so happy with the purchase I made from GiftTree. I sent it to Texas to some family and the kids and adults all loved the tasty treats. I'm so happy that it tasted good. It's hard to know when you haven't tasted it yourself. It was a great gift. I sent 3 towers and each person had nothing but delightful things to say. The contents were a huge hit and there were no complaints. I will definitely continue to order from GiftTree. I sent this to a friend as a get well gift. She said she has never seen anything like it and seemed very happy with it. This is my second purchase from GiftTree and I am very pleased with both orders. GiftTree is my new go to place for gifts. My son just graduated from Navy boot camp and when he saw all the treats, he was happier than a baby puppy. very impressed with it wrapping and presentation. It was beautiful, and was very well received. The recipient really enjoyed this snack tower! He couldn't believe the variety of treats. He said everything that was tasted so far is good! I ordered three towers to be sent to three separate addresses. All three were delivered in tact and on time. I have not seen what the boys received but they were very pleased with them. Thank you for making it so easy and efficient. Bought this for a birthday present for my sister. She absolutely loved it from the presentation down to the treats inside. This would make anyone's day. Would highly recommend this for any holiday or just for whatever. You can't go wrong here. The people who received the gift package said it was really nice and they are enjoying it. Thank you. I gave this as a birthday gift for my niece and she said everyone loved it! Yummy! The presentation was beautiful. It was more than I expected especially for the price. My boss (and his family) were very pleased with the classic box set I sent him with goodies. He said everything was delicious! Needless to say, the recipient was delighted to receive it! My friend loved the basket. She thought it was presented very lovely. It included its own scizzors to open the box. Very cute. I sent this to my sister back East and she was pleased with it. I received a phone call and the daughter of the recipient said the recipient loved the boxes of different delicious sweets, etc. When she had visitor's to the house she shared her items and they also thought they were great. It made a good present rather than flowers for a change. The wrapping presentation and assortment is beautiful. She LOVED it!! And that's good enough for me. The gift was loved by the person that received it. It arrived on time and lifted the spirits of the person receiving it. I wouldn't hesitate in ordering again from Gift Tree. Sent this to surprise a friend who had unexpected surgery. It was very pretty and she said so far everything she's tasted was yummy! I deducted one star only because maybe I have unrealistic expectations but the ribbon looked kind of sad but the boxes were beautiful and it made my friend smile and that was the point! I will be ordering again very happy with the promptness of delivery! I did not see this product for myself as I had it shipped to my grandmother who lives out of town. When I spoke with her though, she seemed very happy with the gift tower in total. She said it was packaged beautifully and she loved how pretty the boxes were. She was also tickled that it came with scissors to open up all the packages as well. Oh, and shipping was super fast. I would definitely send this gift again. I sent to my sister as a birthday gift. She was pleased with the items and how beautiful it was. I sent this gift to my mom. She was so thrilled with it! She opens one box a day and sends me an email of what was inside. It is so much better than sending flowers. Thank you for your prompt, awesome service! My granddaughter ordered this decadent tower for us for grandparents day. The presentation was beautiful and the snacks were fantastic. GiftTree keeps exceeding my expectations and I truly look forward to being able to order for the special people in my life as well as see what surprises my children will send us in the future. Thank you for making Grandparents day fantastic. Very well presented and a great variety! Sent the Classic Confections Gourmet Gift Tower to a dear friend out of state for her birthday. She loved it and loved the beautiful presentation as well. I will be ordering again! I ordered this for my father who lives in another state for Father's Day. It was delivered on time and my dad said the presentation was stunning and the quality of the product was superb. Ordering was easy and I was very pleased.